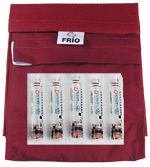 The FRIO® pump cooling wallet has proven to be highly successful in a wide range of climatic conditions. The pump wallets are specifically manufactured to be used with all types of pumps. The wallets have a belt-loop at the back and can be worn comfortably in most situations. 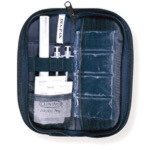 The pump cooling wallets have a waterproof interior liner ensuring that no moisture is transmitted to the pump. Available in black. What is a FRIO? The FRIO Cooling Wallet is an innovative product that keeps diabetes insulin at a safe temperature without the need of refrigeration. The inner part of the wallet is made of Poly-cotton (65%/35%) that has been formed into an open pocket with double-walled panels containing super-absorbent crystals. These crystals are non-toxic and non-flammable. The outer cover is made of a Du Pont fiber called “Cambrelle”. This pouch is permeable and facilitates the evaporation process as well as improving the stability of the temperature inside the wallet. The FRIO Cooling Wallet is activated by immersing it in cold water for 5 -15 minutes depending on the size of the wallet. The crystals contained in the panels of the wallet expand into a gel-like substance and remain in this form for several days. Once activated, the wallet should be removed from the water and towel dried. Allow the wallet to dry for about 10 minutes until any excess moisture in the fabric is absorbed. Next, place the wallet in its outer cover. The FRIO wallet will be dry to the touch so it can be safely carried in a handbag or pocket without causing any dampness. The evaporation process creates a long lasting cooling effect inside the FRIO Wallet which keeps the insulin cool. When in continuous use, the immersion periods must be reduced to about 3-4 minutes so the crystals do not get over saturated. While in use, the wallet must not be placed in a plastic bag or air tight container; it must be able to breathe so the necessary evaporation process can take place. The FRIO Cooling Wallet has been extensively tested by the British Medical Devices Evaluation Unit and the FDA. 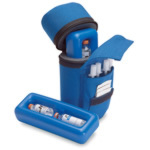 Both groups have approved the use of the FRIO for insulin storage. The FRIO will keep insulin at acceptable limits for a period of 45 hours in a constant environmental temperature of 100 degrees. It is light and compact weighing only 1-2 ounces. It is activated by water, no need for refrigeration, ice, or electricity. It keeps insulin cool for 45 hours for each immersion period. It can be used over and over either continuously or intermittently.